This was the most under-planned trip our family has gone on to date. The primary reason for the trip was for me to go to my fraternity's annual reunion event, one that I've attended only once in more than a decade due to being out of town or other scheduling conflicts. And it's entirely likely that I won't be back in the country to attend the next several, so it's now or never (which is why we went in February). In general, the plan was to spend Friday in Boston and Saturday in Cambridge. On the drive up, Kacey picked out a number of places that we could take the kids, even with the February weather in Boston. We did so much that we wore ourselves out. Friday: We searched Yelp for a kid friendly place that served breakfast near our hotel and it came up with the Trident Bookstore. Seemed kind of unusual, but we thought we'd check it out. Big win. 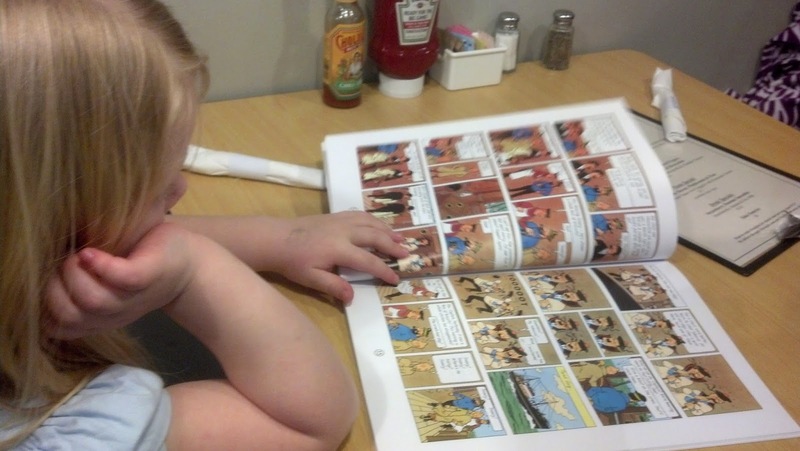 Cori discovered the Tin-Tin comic series and was able to browse the shelves while we waited for our fulfilling portions to arrive. As I said earlier, this was the least planned trip we'd been on, and we forgot to pack enough cold-weather gear for the girls. So we started off on a shopping expedition in Back Bay that ended in downtown crossing...apparently kids in Boston don't buy winter coats. Copley Square Tortoise and the Hare statues...note: no coats. Warmly dressed, we then headed towards the Boston Children's museum, stopping at a museum for the Boston Tea Party to have tea. 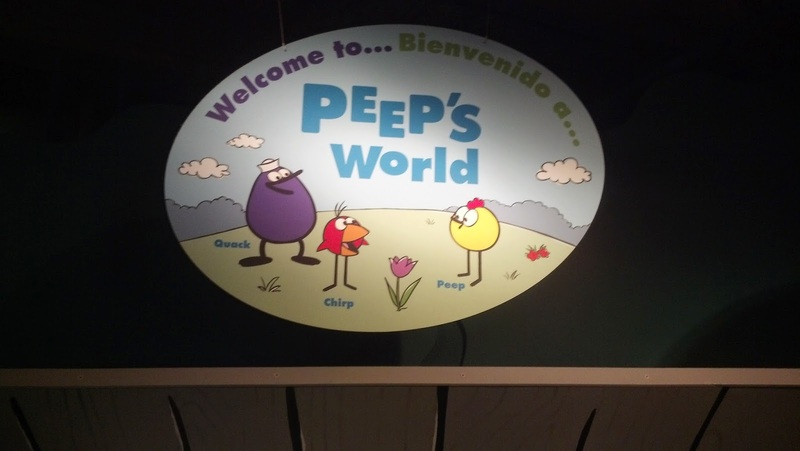 At the Boston Children's Museum: Peep's world was a big hit, but good luck getting good photos in a dimly lit area fully of energetic kids. Here are some other parts of the museum. This is Peep's World, and you're just livin' in it. There's a room for the under-3 crowd. Throwin' it down on the dance floor! From the museum, we headed up to Boston Common & Boston Garden. We ran into some thundersnog in the Boston Common: just as the sun was setting, the fog rolled in, lightning flashed, the thunder boomed, and it began to snow! We made out way back to the hotel, then we all went on to an alumni gathering at Mead Hall. Note: The kids didn't nap the whole time. Breakfast at Trident again (it really is that good! 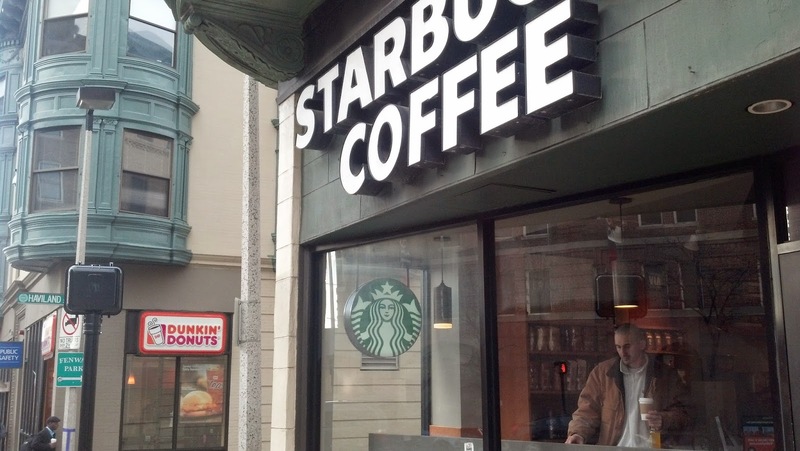 ), followed by some Dunkin' Donuts. Look closely at the crossing sign for your blessing. We then headed across the river in a failed attempt to take guided tour around MIT. I mean, the tour was good to go, but the kids melted down because they didn't nap yesterday. Our little academic on the step of M.I.T. We went back to the hotel for the kids to nap, but I had to trek down to Whole Foods by the Christian Science mother church because there are no real supermarkets in Back Bay anymore. I attended my fraternity event later that night, and then returned to the hotel. Sunday: An informal part of the reunion is Dim Sum in Chinatown for breakfast. We ended up having two large tables and friends came in and left and were replaced by other friends who had been running late. Totally relaxing. With our bellies full, spirits restored, and kids about to fall asleep, we began our drive back to Washington, D.C.